Read this manual carefully so as to understand all the functions of the device. Keep these instructions for future reference. – A strong ultrasonic wave frightens animals. The animals avoid the area because of its unpleasant ultrasonic frequency sound. The sound is activated when an animal enters the range of the repeller. Thus, animals cannot get used to the sound, and the repulsive effect is stronger. – A strong flashing light scares animals. The strong flashing light is activated when an animal enters the range, then the animals will be scared and flee the area. lnstall this device in the direction of animals invading the area. When installing this device, choose a place where the solar panel can get as much sunshine as possible, and avoid the obstacles to block the sunshine. If there is dust or dirt on the solar panel, wipe them off to ensure the high efficiency of photoelectric conversion. Fix the spike stake on the unit, insert the unit into the ground. The spike will be harder to connect for the first time which is normal. After using for several times, it will be easy to install, so do not use external force to hammer on the top of the repeller. When selecting the installation place, please choose a suitable terrain to ensure water will not drop on the USB interface (see chart) in bad weather conditions, so as to avoiding damage to the product. 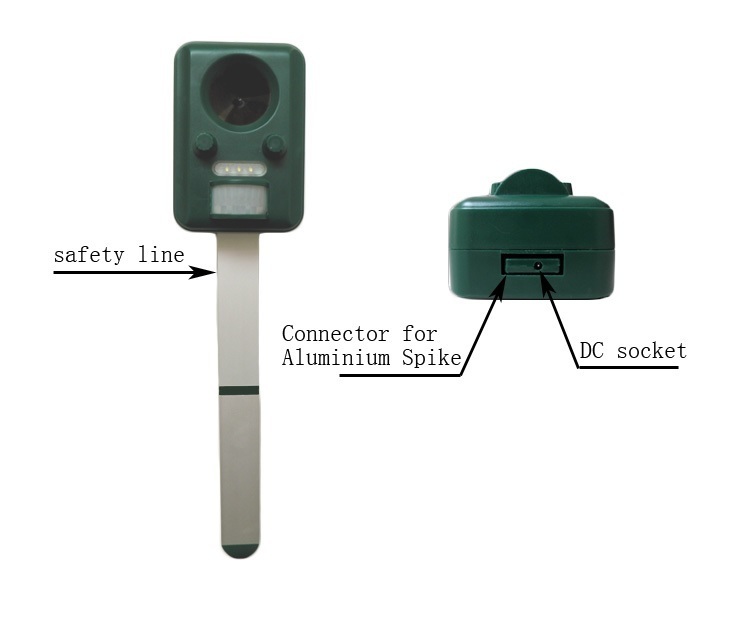 The back of device has a hanging hole; you can hang up the device to a fence, wall or similar. – Button “SENS” (Left): Is for adjusting sensitivity and distance. By turning the knob clockwise, you increase the range of protection. To repel small animals, turn the knob up to the right. – Button “FREQ” (Right): Frequency control. By turning the knob clockwise, you increase the frequency. – 1: 13.5KHz-17.5 kHz Repels animals such as skunks, mice, small rodents. – 2: 15.5KHz -19.5 KHz Repels animals such as large dogs, foxes, raccoons, deer, skunks. – 3: 19.5 KHz -23.5KHz Repels animals such as small dogs, cats, birds. – 4: Strong flashing light. – 5: All functions working together, sweeping frequency from mode 1 — mode 2 — mode 3, and turn on strong flashing light. This is the best function as it covers all the functions of the device. Important: To change a setting, you must always start from OFF position and then go directly to the function you need. If you want to change the setting, you always have to restart from Off position. (Ex. to go from frequency 3 to 5, you first need to switch the frequency knob to 0 and then go directly to 5). When using the product for the first time, please fully use the battery power (included with the device). When the power has been fully used from the batteries, the red light low voltage indicator will continue to flash. Please then connect the device to a USB output interface (such as a computer, cell phone charger or MP3), using the USB cable included with the device. After full charging, the red indicator will turn on – and stay on. When the battery power is fully used, recharge again using the same procedure. Due to transportation, warehousing and distribution, the time needed to recharge the batteries may initially vary. This is normal. After charging the batteries three times, the batteries will stabilize its charging pattern and duration. If the rechargeable batteries are new or the batteries have been stored in the device without using it for more than one month, it is normal for the rechargeable batteries to charge quickly. In this case the batteries will need to be charged three to five times to stabilize their charging pattern. If the rechargeable batteries have been used for a long time and are charging too quickly, it may mean that you need to change the batteries shortly. If the device is not used for a long time, we advise replacing the three 1.2V AA rechargeable batteries (replace with Ni-Cad or Ni-MH). The better quality the batteries are, the better overall performance of the device. Please dispose the batteries according to your country laws and regulations. The ultrasonic waves are really powerful to scare animals efficiently. It happens that human can hear part of its range. So put the device as far as possible from human life place to avoid possible annoyances. Don’t install this device in a children and baby playing ground area.